Indoor plants are beneficial in so many ways: Not only are they a lovely visual addition to a space, creating softness and adding color, but they also perform the dirty labor of cleaning toxins from the air. 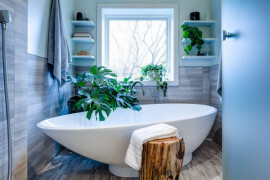 If you’re thinking that you’d love to add plants to your home, but have had bad luck keeping them alive, consider putting them in your bathroom. 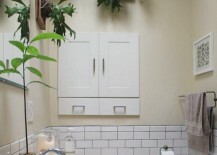 Plants generally thrive on the regular doses of moisture that come from your shower. 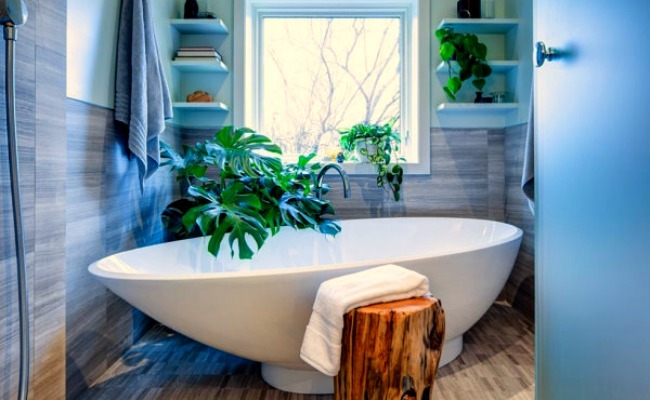 Even if your bathroom is on the dark side, certain plants—especially those that thrive in the lower levels of the rainforest in the natural world—don’t need much. 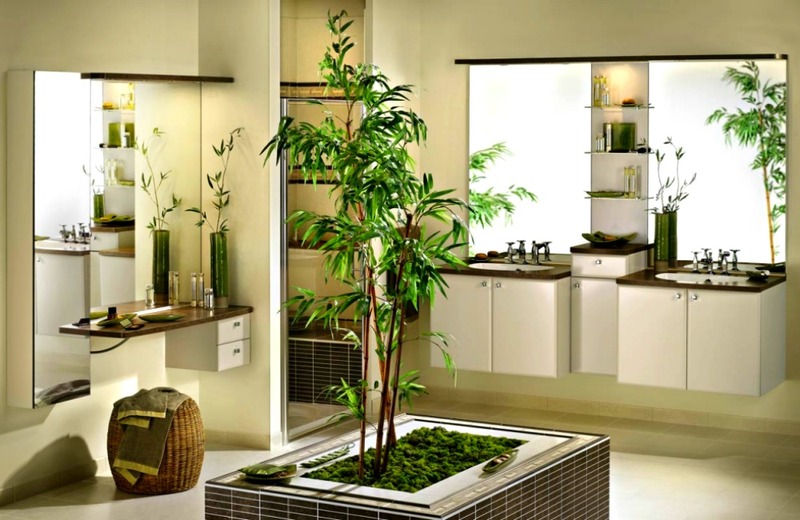 Below you will find both decor and plant suggestions for greening your bathroom naturally. Elkhorn ferns look kind of like antlers, don’t they? 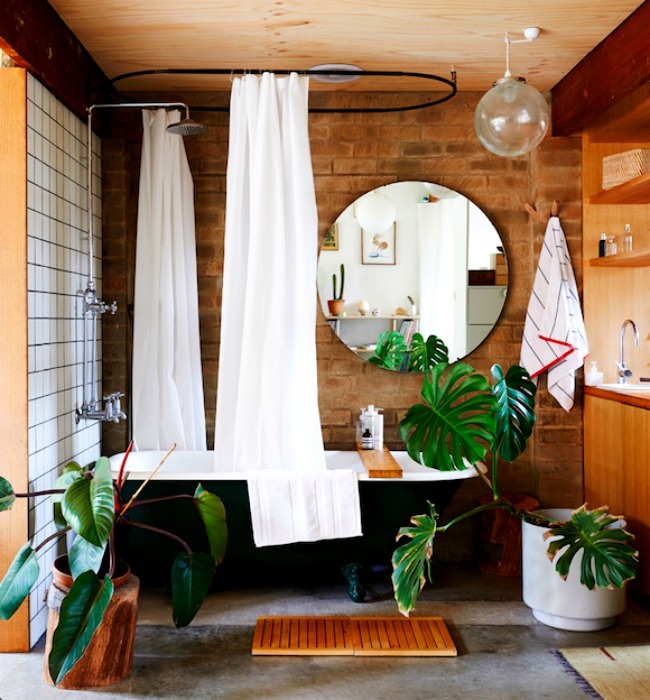 Most ferns are shade-loving so they don’t need a lot of light, though they do need some—and they love bathrooms. 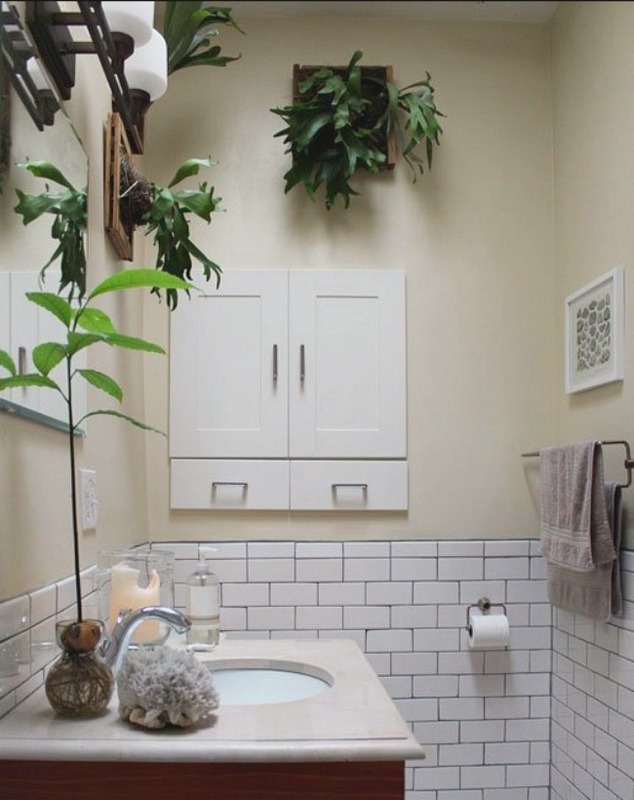 Mounting the ferns in frames, as shown in this vintage Echo Park bathroom, is a fun and interesting way to show off their unique shape. 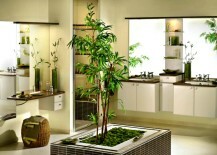 Bamboo is fast-growing, comes in all sorts of shapes and sizes, and is the prettiest green color in all its variations. It does need a fair amount of water though, so you’ll have to keep an eye on bamboo to keep it from drying out. 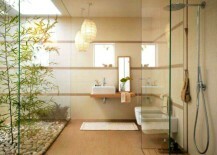 It’s worth it though; how about a beautiful bamboo tree in your bathroom like this one? 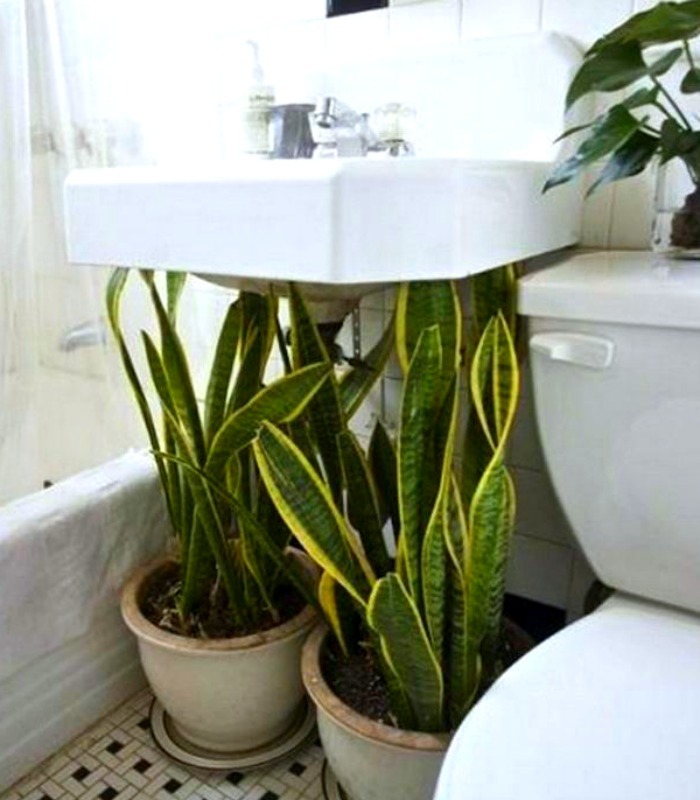 Of course, if you have a skylight, you can do some pretty creative things with plants in the bathroom. 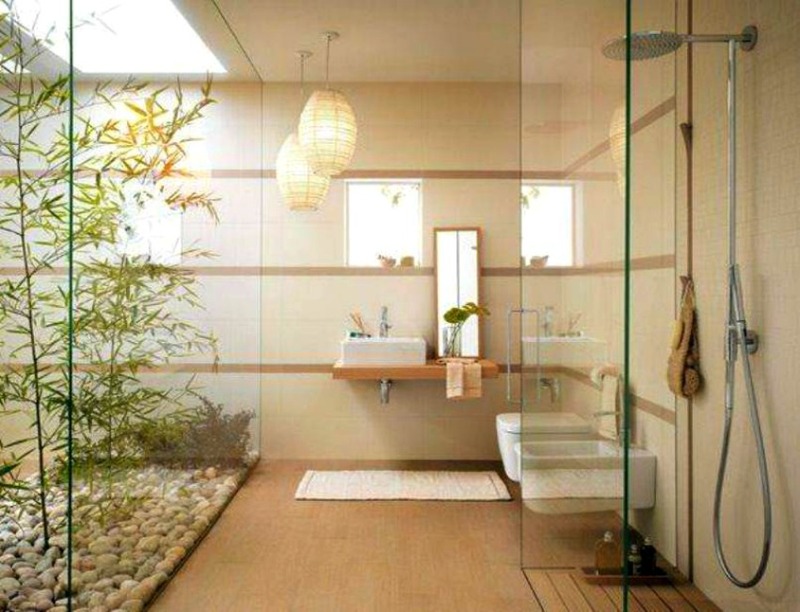 This beautiful Zen-style bathroom also features bamboo, but in a very different way from the style above. 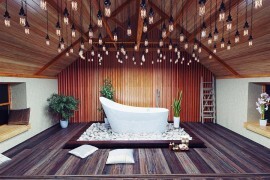 It would be hard to leave this space and feel stressed-out, wouldn’t it? Living walls gained popularity a few years ago and are still going strong, as both a style statement and an alternative to potted plants. 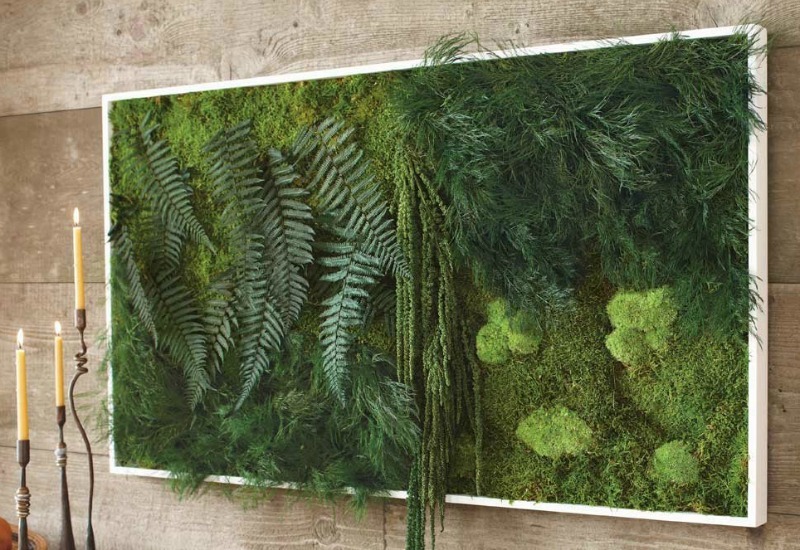 There are companies that make living walls of plants, and plenty of DIY tutorials if you want to make your own. 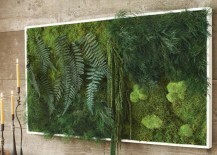 Popular plants for these installations include mosses and ferns, as in the example below (which used to be available for purchase from VivaTerra), but there are many other types of plants and configurations that can function—and the plants are especially happy in moist bathrooms. 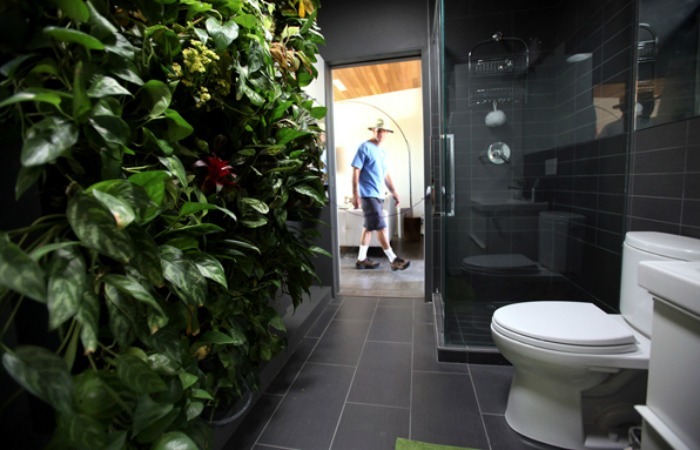 A completely different take on a living wall is this one, which was built for 2013’s Solar Decathlon, held by the U.S. Department of Energy. 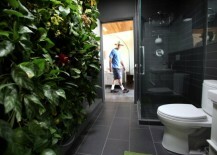 These plants cool and purify the air in this bathroom in Irvine, California. Image by Stefano Paltera for the U.S. Department of Energy. 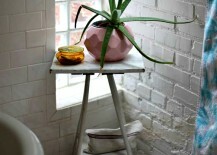 Aloe plants come in a huge variety of sizes, shapes, textures and patterns. 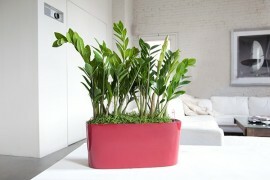 They are incredibly easy to care for, and only require watering about once a month, since they are desert plants. 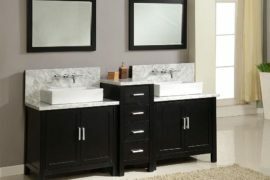 They do need a fair amount of light, so they are ideal for bathrooms that get plenty of sun. 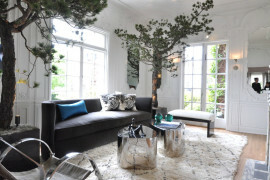 Or, like this one, a spot in front of a window, no matter how small. 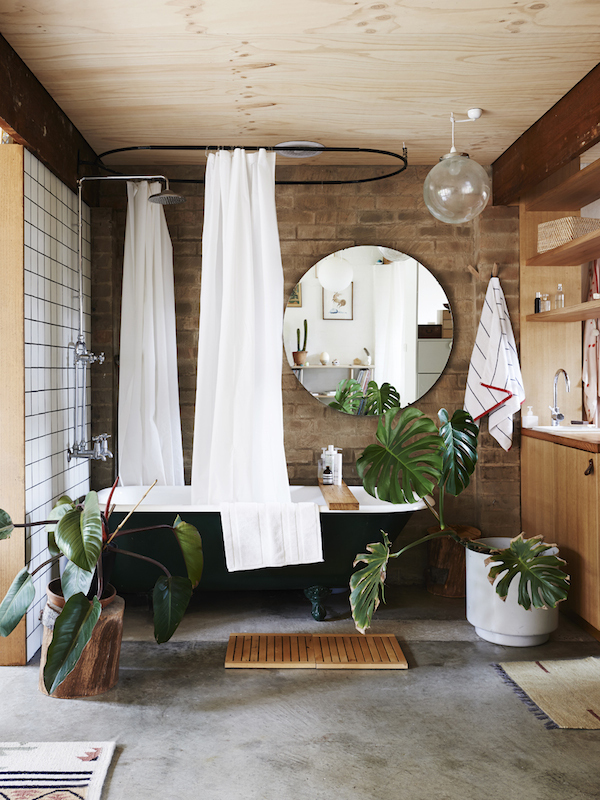 The Monstera plant, which is native to Mexican and Central American forests, creates a spa-like atmosphere in even this smaller-sized bathroom. It’s a graceful, easy plant that needs warmth, moisture, and some (but not oodles) of light. 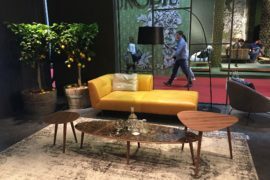 Matching Monstera with natural materials, and especially wood, complements the large green leaves. Again, even in a smaller space, this large-leafed plant fits right in. 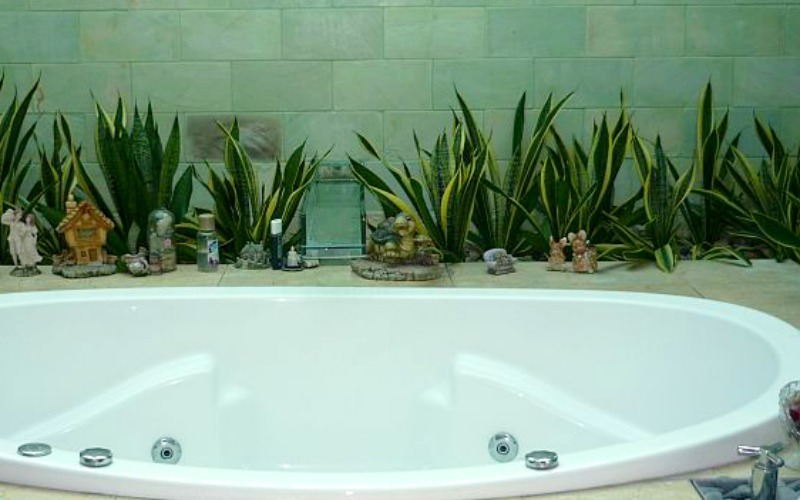 You can find Mother-in-Law’s Tongue plants fairly inexpensively, and a simple and very easy decor idea is to just line a bunch of them up in a row on a tub shelf (perhaps mix with large crystals or other decorative objects, as shown in the example below). These hardy plants are tops for absorbing toxins—and that’s according to NASA. 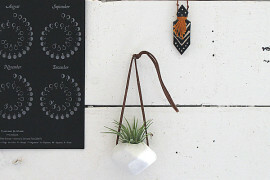 They are also known as Good Luck plants and they hail from West Africa. 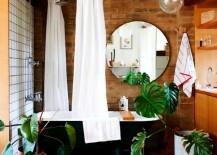 This incredible idea for covering up ugly under-sink pipes comes from the aptly named site, Houseplants as Camouflage and can be found in the Williamsburg, Brooklyn apartment of designer Chad McPhail and singer-songwriter Ed Droste of Grizzly Bear. And just imagine; all those drops of water that fall whenever you wash your face or hands would be gladly received by the plants beneath! English Ivy is an invasive species in the US, so this plant should stay indoors. 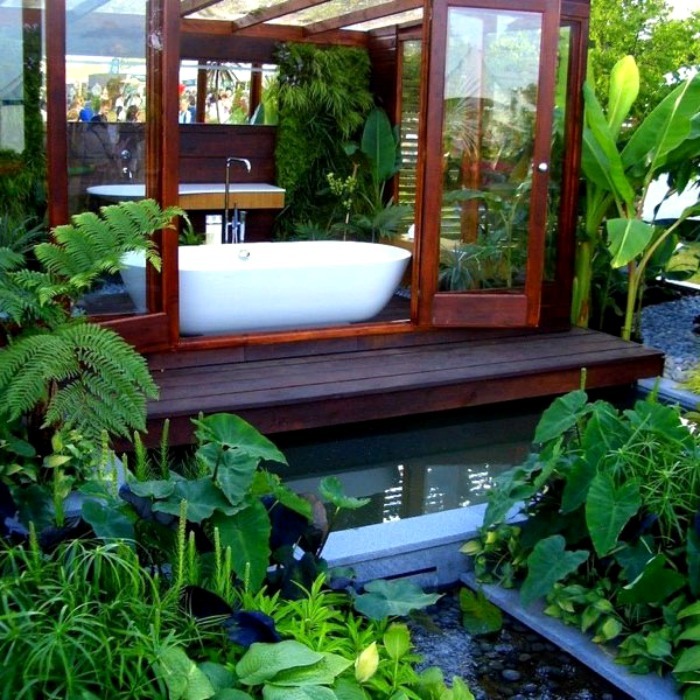 Yet as long as it does, it really can be an incredible addition to spaces, as it will climb up and around almost anything (and yes, you can certainly ‘train’ the plant to grow in certain areas and not others—though it will always eventually grow toward light, so keep that in mind). 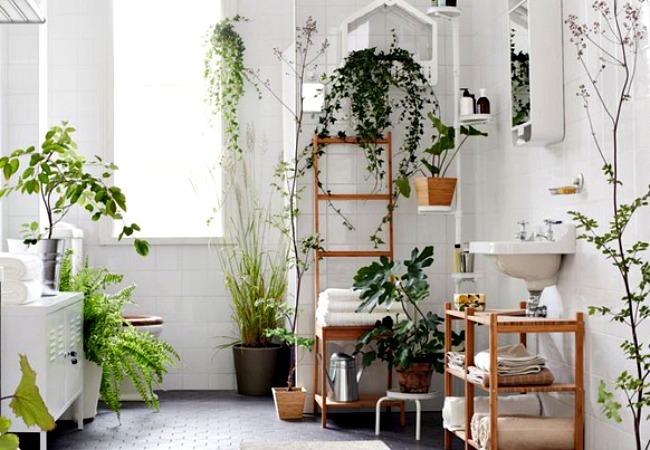 The bathroom below combines a number of plants, but several types of ivy help make the statement soft and a bit feminine. This incredible set up is the work of designers James Wong and David Cubero and is located at the Burgbad Sanctuary. 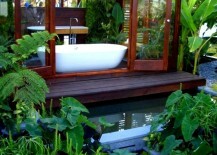 Imagine being immersed in warm, bubbly water while listening to the birds sing and the frogs trill. 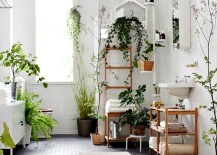 It’s obviously easy to have plants in your bathroom when it’s outside! 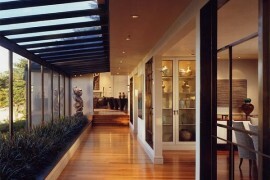 Via Besthomedesigns.org. 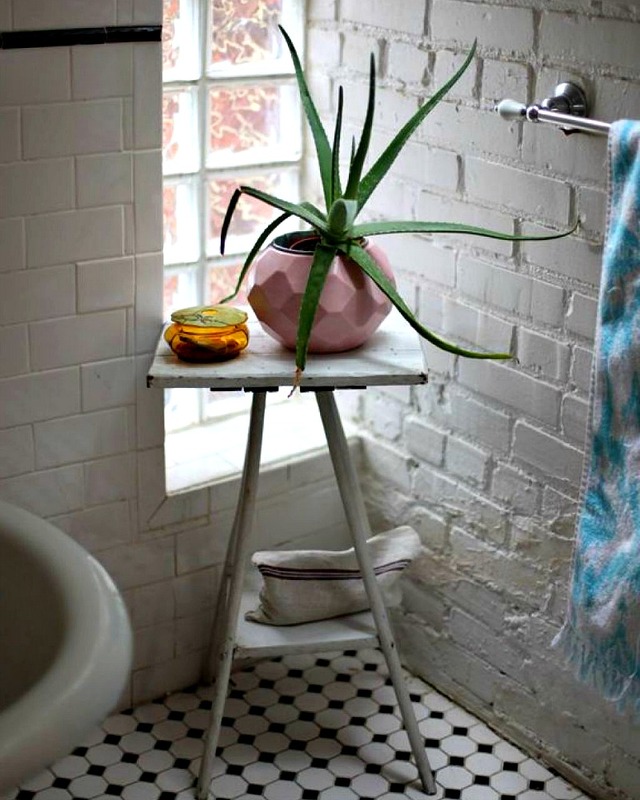 Want even more bathroom plant decor ideas?